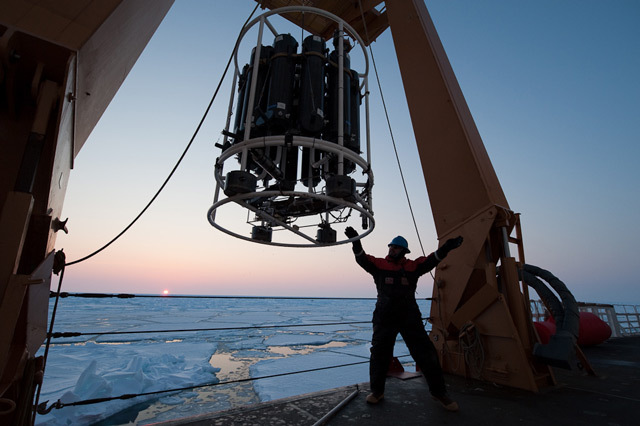 How do scientists track deep water currents and find tiny amounts of dissolved metals in the icy waters of the Ross Sea? High tech tools make the research possible. 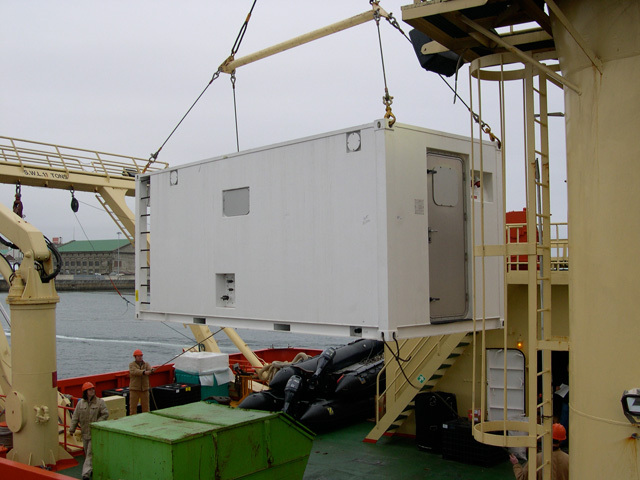 While the team is at sea, they will use a suite of different devices–some lowered over the side of the icebreaker, plus free-swimming robots and entire rooms full of laboratory equipment–to accomplish their goal of understanding the Ross Sea ecosystem. Read on below to learn more about the tools we will be using. Scientists at Rutgers are trying to stretch the limits of ocean technology, in an effort to observe and monitor the ocean as never before. 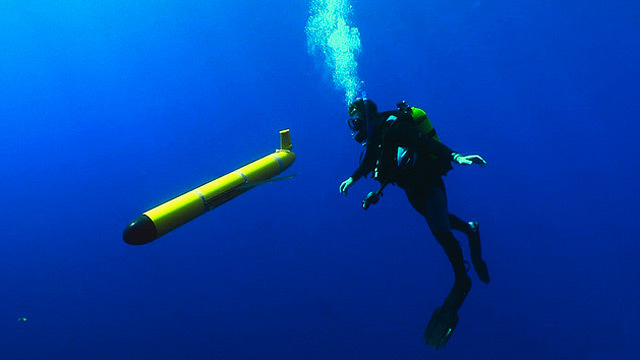 One of their most innovative gadgets is a remotely-controlled underwater robotic glider, which can swim up and down through the top 300 feet of the ocean for over a month at a time, all on its own. On each dive, it collects data on temperature, salinity, chlorophyll and more while it “glides” through the ocean. Every few hours, the glider surfaces, sticks it’s tail fin above the water, and makes a satellite phone call back to the COOLroom in New Jersey. During the call, the glider can receive new instructions from mission controllers, or if it doesn’t get any new directions, it will continue on its existing mission. It then transmits its recently collected instrument data back to the lab, where computer scripts process the data and make it available to the world. CTD is an acronym for the parameters that this device measures: “Conductivity (saltiness), Temperature, and Depth.” The CTD itself is a set of small probes attached to a large metal rosette wheel (see image). 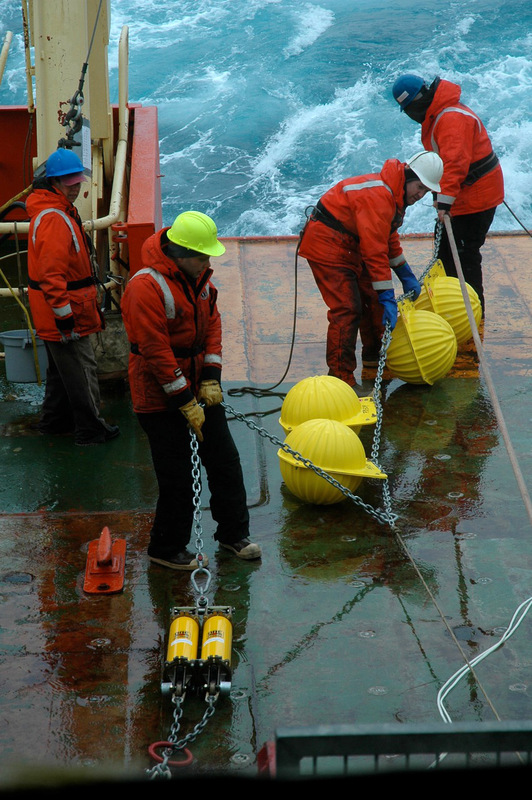 The rosette is lowered on a cable down to the seafloor, and scientists observe the water properties in real time via a conducting cable connecting the CTD to a computer on the ship. The water temperature and salt content, or salinity (which is computed from the conductivity), is important to oceanographers because it tells us about the types of water masses present, and how they are moving in the ocean. There can also be a host of other acessories and instruments attached to the CTD package. These include Niskin bottles (gray bottles in image) which collect water samples at discrete depths for measuring chemical properties, Acoustic Doppler Current Profilers that measure the horizontal velocity, and oxygen sensors that measure the dissolved oxygen content of the water. A CTD being brought back onboard in the Bering Sea. Photo by Chris Linder, WHOI. Since we are interested in comparing how well microscopic plants grow from waters influenced, and not influenced, by the Modified Circumpolar Deep Water (MCDW) we have to be careful about what would happen if some days were cloudy and dark and others were bright and sunny. A bright sunny day from “minus MCDW” waters and cloudy days while sampling from MCDW influenced waters might actually create conditions where phytoplankton growth appears lower in iron rich MCDW waters! In that case, however, we might be tricked by an effect of the weather rather than one truly based on the composition of the seawater! 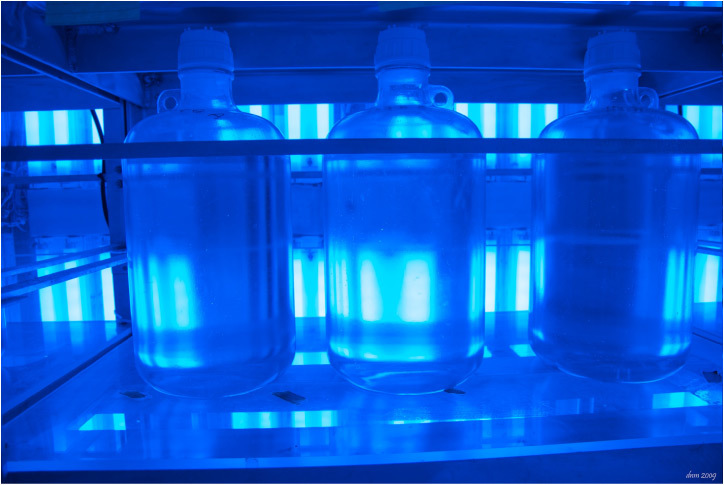 We’ve chosen to eliminate this problem by doing our “on deck” incubation experiments in the “Blue Room”, a climate controlled room with controlled blue lights. The lights are blue to provide the spectrum of light you get in the ocean at several meters depth (about 15 meters or 49 feet for our Antarctic work) rather than the white light seen at the surface. Ask us or your teacher why ocean water appears to be blue! Vials of seawater in the 'blue room'. 20 mL samples of ocean water are “spiked” with C-14 (as bicarbonate which generates radioactive carbon dioxide). These “photosynthetrons” provide light ranging from near darkness to really bright. After 24 h, we can tell how much photosynthesis has occurred at what light levels. 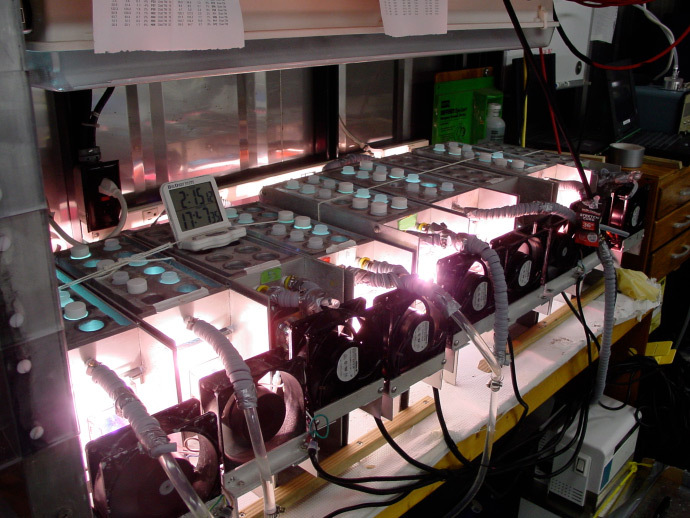 We expect “high Fe” stations to promote more photosynthesis at high light and also do better at low light. The photosynthetron in the lab. Small vials with radioactive C-14 are treated with acid (to “drive off” the carbon that didn’t get “fixed” by photosynthesis) as carbon dioxide. The remaining C-14 in the vials represents the C fixed by photosynthesis, which gives us the primary productivity. The C-14 is counted in a scintillation counter. The radioactivity makes a special fluid “glow” and the counter measures this light. The more light, the more C-14 the sample contained. 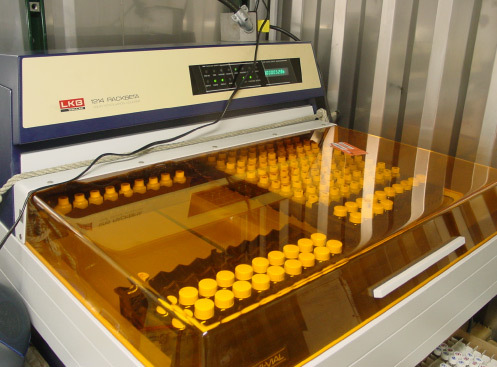 A scintillation counter in the lab. 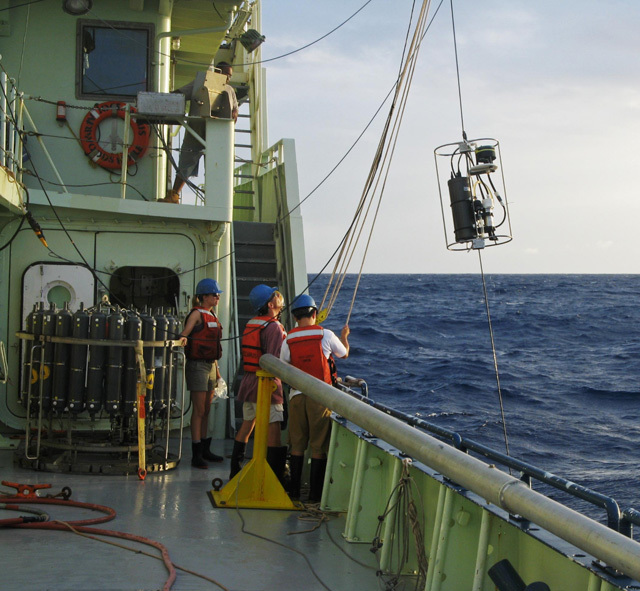 The iron team, led by Dr. Chris Measures from the University of Hawai’i, will obtain trace-metal clean water samples using a special rosette system and determine the concentration of the trace elements iron (Fe), aluminium (Al), and manganese (Mn). The University of Hawai'i team works in a lab like this one. The Particle Team, led by Dr. Phoebe Lam from the Woods Hole Oceanographic Institution, be collecting marine particles from the water column using battery-powered pumps. These are filtration systems that filter hundreds of liters of seawater through different sized filters. A mooring is a series of instruments spread along a cable that extends over a portion of the water column. A heavy anchor holds it in place and glass floats keep the line taut and upright. Moorings give scientists a look at how water properties change with time at a fixed location—essentially, a movie of what passes by. Bruce Huber and Julius Busecke will recover moorings located near Cape Adare with their three years worth of data. This long time series will give them an unprecedented, detailed record of the Ross Sea components of Antarctic Bottom Water. Working on deck to deploy a mooring.